The FIFA 19 Team Of The Week is here, and our predictions game is on point this week, with five of our guesses making the side. We predicted that Everton's Richarlison, Napoli's Dries Mertens, Inter's Joao Mario, Torino's Andrea Belotti and RB Leipzig's Timo Werner would make the selection, and we were right. Big pat on the back for us. Other notable inclusions in the team of the week include Leicester's Ben Chilwell who kept a clean sheet in his side's win over Cardiff, West Ham's two goal hero Felipe Anderson, ex-United midfielder Daley Blind and Portugal winger Ricardo Quaresma. 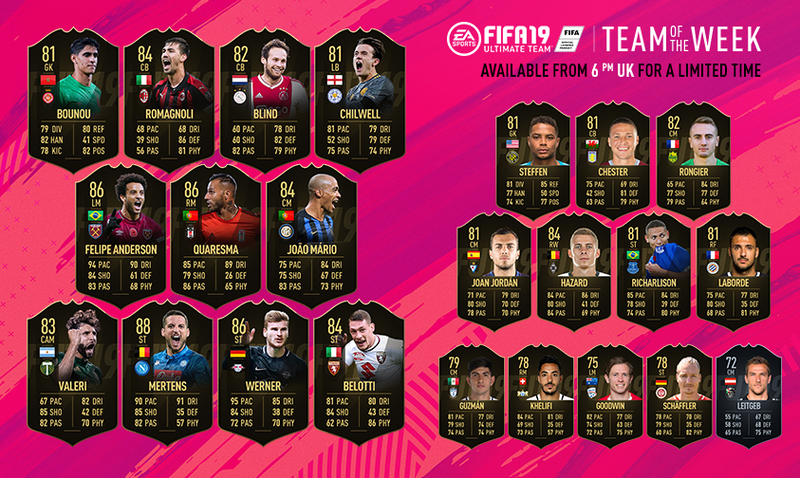 TOTW 8 will be available in packs from 7th November at 18:00 GMT until 18:00 GMT on 14th November.